The zeta meta is here... Just faced a team in the tournament that was so unimaginably powerful I don't think anything else even comes close. Darth maul, Palp, Vader, General Kenobi and B2. All over 200 speed. Wow. I run a boba lead, cad bane, 88, Lando and 215 speed sthan, all maxed out and I didn't even take the protection off of 1 of their guys. I've faced a QGJ zeta and actually managed to beat them a few times but this maul team is untouchable. They killed 3 of my guys before my sthan even got to move. As soon as you crit one of the sith they gain stealth and 20% TM... PLUS because of GK's unique they also gain crit immunity and Kenobi taunts...I'm so thankful this guy isn't on my server because I'd never see rank 1 ever again. Edit: I'd love to see a QGJ zeta or maxed out Chaze + Wiggs face these guys but I don't suspect they'd do much better. Any videos of that would be epic though. This guys palp was at 223 speed haha plus a 20% TM bump. That's pretty close to most jawa engineers. It would still mess droid teams up because they couldn't crit 3 out of 5 toons who are stealthed right off the bat and can't be critically hit. So no extra TM for them. Not even sure it's relevant to show when they don't have a semblance of hope to win being both on defense and not having B2. It's like that post not too long ago of someone beating the QGJ zeta lead when that QGJ team didn't have Yoda, and certainly not Kenobi. Actually for a defense it wasn't all that bad. I wonder how much different would have it been with Baze or B2 instead of tfp. 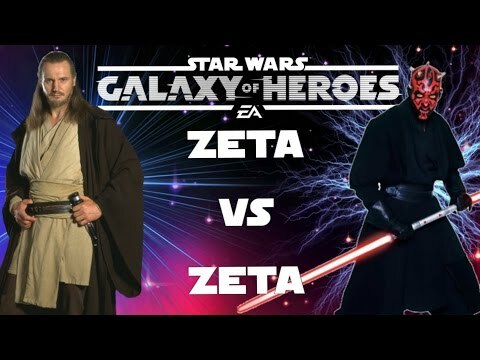 what about zeta sidious in the team with potency mods? make sidious great again!!! I think Sid in a Vader zeta lead squad would be better because the dots would count for more there. Don't really need potency mods. With his zeta at max gear he has 72% potency. Would get more out of CD or cc.